Treat yourself to our spectacular Shooting Star penthouse. This condo is perfect for one or two families, or three couples. You will not find a more luxurious, serene, well appointed, better served, ski-in/ski-out condominium in the Deer Valley/Park City area. Our local staff is on hand to ensure that your vacation is perfect. They are available to you and are just a phone call away to help with any questions, reservations, difficulties, or any needs that may arise 24/7. Walk out the door of the ski locker room and you are just a few steps away from the best skiing Deer Valley Resort has to offer. Step out onto the Silver Buck run down to the Silver Strike lift. After a fantastic day of skiing, relax in one of the two large common hot tubs, lounge by the fireplace, or be entertained with one of our four new flatscreen HDTV’s complete with Blue-ray DVD players and DirecTv. There is also a Playstation in the loft bedroom for everyone to enjoy. Our large two bedroom plus loft, two and one half bath penthouse very comfortably accommodates nine people with a luxurious king bed in the master. There is a cozy queen bed in the second bedroom. The loft bedroom offers an extra long pyramid bunk, with a queen size bed on the bottom and a twin on the top, and another set of extra long twin bunk beds. These beds are great for kids, but also very comfortable for adults. The master suite also offers an oversized jetted tub for your enjoyment. Each bath boasts L’Occtaine bath and body products for your enjoyment. The gourmet kitchen is fully equipped and perfect for your entertaining needs. The living area has a fantastic 30 foot vaulted ceiling and looks out on the most beautiful views Empire Canyon has to offer. 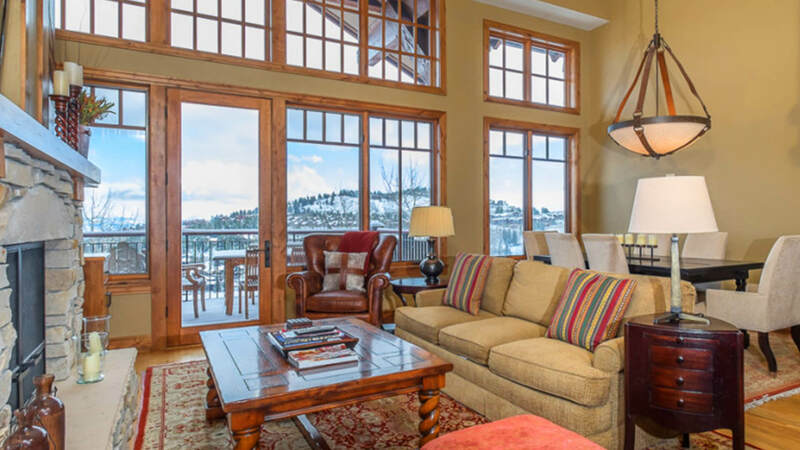 VISIT OUR WEBSITE FOR MORE INFORMATION – SEE HOW WE CAN MANAGE YOUR PARK CITY/DEER VALLEY VACATION PROPERTY FOR YOU!